Album of the week | Phoenix – Bankrupt! 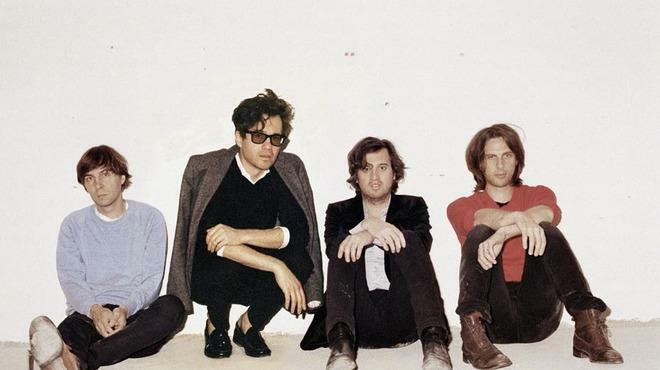 The lyrics of Phoenix's fifth album read like a litany of luxury: "chandelier," "crystal," "Caledonian rich and young," "Scandinavian leather," "Voyageur canoes," "the bronze, the silver, the gold," "Bel Air," "cruise ship," etc. The music is equally grandiose, layered in dense vintage synthesizers that shroud each song like a thick coat of statically charged mink. There's a clever trick employed throughout, where each instrument is doubled in the left and right channels, the sonic equivalent of a higher thread count. The results are immersive, a mineral mud bath to ease into. If the preceeding Wolfgang Amadeus Phoenix signaled the quartet's move into its Classical period, then Bankrupt! must be their majestic Romantic record. Their Hector Berloiz Phoenix. The sequence of Bankrupt! mimics that of Wolfgang. The singles come stuffed up front, before an extended ambient keyboard interval, followed by a closing run of subtler pop gems. Once a singles band skilled at expertly replicating trends (the Strokes' jangle, Air and Daft Punk's Parisian lite–funk), Phoenix has carefully curated a unique formula, and developed an ability for complete album craft. Not coincidentally, the foursome can now headline festivals. It went from the fate of a 10cc to being a sort of Steely Dan for Millennials. Thankfully, minus the smooth jazz. Pay closer attention to the lyrics, what's sung between the snippets of Robb Report imagery. Lift up the doilies and discover darkness, dust and mold: "Cheap fixtures," "bartending crucial lies," "fake riches," "idols are boredom," "you're sad and underweight," Thomas Mars sings in his fragmented from-notecards manner, with a naturally smooth and melodious voice that seems to waft from a man splayed decadently across a settee. It's a voice that innately sounds doubled (even when it's not), at once wan and wistful. He's better at English than an interview would let on and has a tannic wit. Few other songwriters would rhyme "ranunculus" with "part-time holy bachelors." Bankrupt! speaks to the emptiness and slow poison of wealth in its own terms, while blurring the lines between the language of advertising, love and religion—between high art and low art. "Drakkar Noir"—a song named for a douche-y aspirational cologne of the '90s (I had its black bottle in my teenage bedroom)—morphs via a keyboard motif into "Chloroform." Words like "Presbyterian" and "Holy Father and Son" jump out amidst the deceptively vapid romance. In the closing "Oblique City," Mars seemingly stands in the post-apocalypse and says, "Coca-Cola / beaten up bottles / Is there anything else… / Buried Mayan numerals. "Plus, I just savor the way he says the French words: Dwaqqah Nwaah, Uh-blick zitee. An early song is titled "The Real Thing," an old marketing slogan for Coca-Cola. The cover is a cheap icon from a juice box, a slot machine. Yet it looks perfectly Warholian on your iPhone screen. The meticulously constructed LP carries an ersatz epicness that ends up being quite epic. The band claims it purchased the soundboard used to mix Michael Jackson's Thriller, employing it here as if that would imbue some remnant platinum juju. But it could all just be a dry joke. At the moment, Bankrupt! sounds like the pop album of the year. It might not in two months. But isn't that the point?